Both ancient and modern, the integration between the two cultural forms old make Nha Tho street that became extraordinary. Hanoi has long sinuous streets, but also the small street just a few hundred meters long and always seem to contain many interesting and unique things to remember. Nha Tho (Church) street also in the list of such streets. It is known as a place that contains many interesting and special. Streets located not far from Hoan Kiem lake, next to Hang Hanh street. Although street no words “Hang” on the head but people still ranks Nha Tho street in the old town of Hanoi.Short and small city, but never deserted. 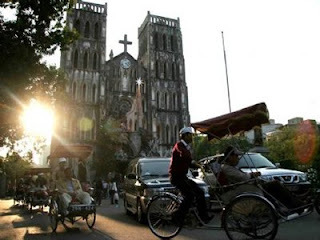 Here, we encounter more opposition between two very unique form of new and old culture, both conscious system Buddhist religion and Christianity. It is easy to know which is more than the contrast between two schools of Eastern and Western architecture. Besides the classical style house float waving moss odor of time, you will easily feel the squeeze of architecture and modern Western. The luxurious cafe or fast food restaurants serving foreign guests grew close together. The idea this would lose the historic character of this famous street, but it seems that the familiar harmony between two opposite styles that make distinctions of re Church Street. 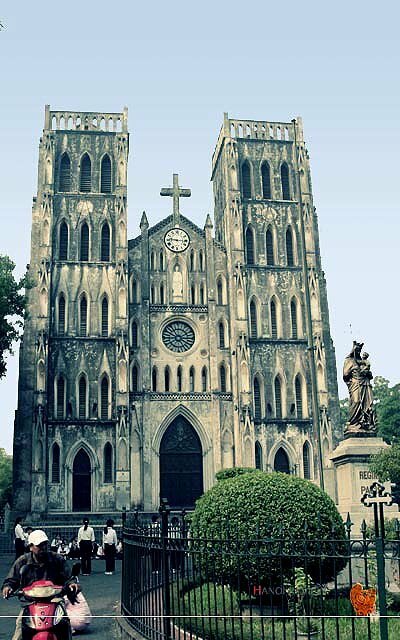 Called Nha Tho street because there’s Hanoi minster. The church was inaugurated on Christmas in 1887 and known for the most typical and characteristic of the art of medieval architecture with curved arches, wide, toward the top of heaven, get light. With the architecture, will certainly realize that the church was built in line with impressive Gothic architecture patterns, characteristic patterns. This architecture has always impressed on a solemn religious space. Each year when Christmas is here again to become more vibrant than ever. The christian believer come up here to welcome a new Christmas wish good prayer for life. It also Ba Da pagoda, also known under the name Linh Tu pagoda. Ba Da pagoda is located at Nha Tho street. Today, the temple is the headquarters of the Buddhist association of Hanoi City. Today, Nha Tho street youth also known as a place where there are many delicious and popular cuisine. The fermented pork roll fry (Vietnamese meaning: nem chua nuong) of Ms Thanh was 85-year-old . This place is always crowded at any time of day. Do not know the shop of fermented pork roll fry appear here , the young of Ha Thanh just know that ten years living in Hanoi, they knew shop of fermented pork roll fry, and this place became gathering points often their stories with no beginning no end.